BEIJING - Stock markets turned lower in European trading on Thursday as a rebound in oil prices ran out of steam. Germany's DAX fell 0.2 percent to 9,609.26 and France's CAC-40 shed 0.3 percent to 4,273.36. Britain's FTSE 100 lost 0.1 percent to 6,155.44. On Wall Street, futures for the Dow Jones industrial average and Standard & Poor's 500 index declined by 0.5 percent each, suggesting a decline on the open. Markets had risen the day before on the publication of the minutes of the March meeting of the U.S. Federal Reserve's board, which showed members split over how to respond to slowing global growth. The Fed ended up voting 9-1 to leave its key rate unchanged. Ian Shepherdson of Pantheon Macroeconomics said the minutes showed a clear split over how fast inflation will rise toward the Fed's 2 percent target and how badly global weakness may hurt the economy. "The release of the Fed minutes overnight largely confirmed that there will not be a rate rise in April, and there's little in the statement or recent U.S. data that pushes strongly for a rate rise in June either," Angus Nicholson of IG said in a report. The Shanghai Composite Index shed 1.4 percent to 3,008.42 while Tokyo's Nikkei 225 advanced 0.2 percent to 15,749.84. Hong Kong's Hang Seng added 0.3 percent to 20,266.05 and Sydney's S&P-ASX 200 rose 0.4 percent to 4,964.10. India's Sensex declined 0.5 percent to 24,786.55 while Seoul's Kospi added 0.1 percent to 1,973.89. Biotech drug companies in the U.S. made their biggest gains in almost five years after Pfizer dropped a plan to buy Botox maker Allergan for $160 billion. That led investors to wonder whether Pfizer will look for other possible acquisitions. Pfizer and Allergan walked away from a proposed merger after the U.S. Treasury Department announced rules that made the deal less appealing. Pfizer rose $1.57, or 5 percent, to $32.93, its biggest gain since 2011. After strong gains the day before, the benchmark U.S. crude contract edged down 8 cents to $37.67 per barrel in electronic trading on the New York Mercantile Exchange. The contract soared $1.86 on Wednesday. Brent crude, used to price international oils, dropped 3 cents to $39.81 in London. It jumped $1.97 the previous session. 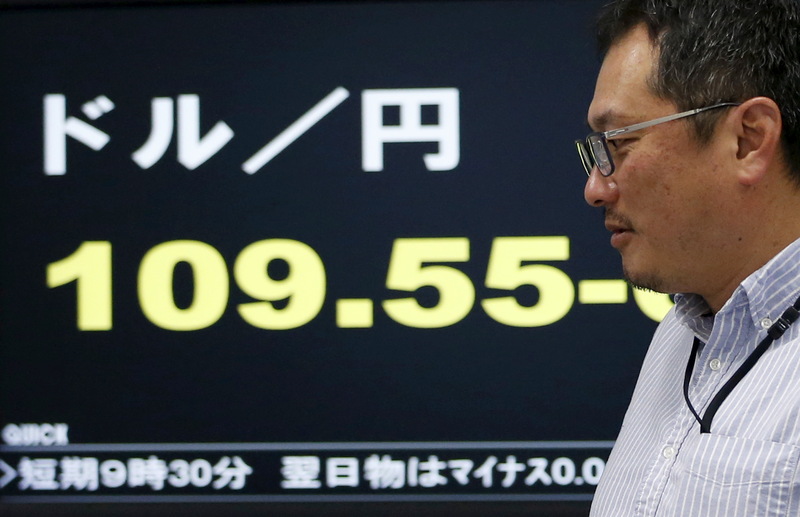 The dollar weakened to 108.30 yen from Wednesday's 109.16 yen. The euro declined to $1.1381 from $1.1400.